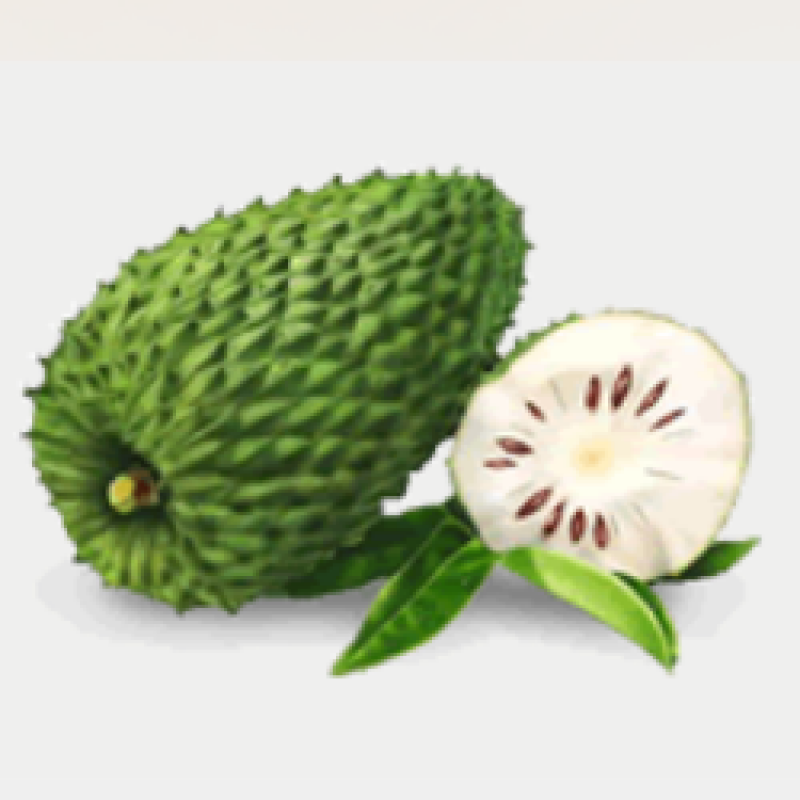 Soursop (Annona muricata L.), also known as graviola, guyabano, guayabano guanabano and babana, is a shrub or small tree 3-10 meters in height. It is adapted to warm, humid tropical climate, and can tolerate both drought conditions and partial shade. This fruit crop grows in any kind of soil but prefers loose, fairly rich, deep loam and well drained soil with pH ranging from 6.1 to 6.5. It thrives well from sea level up to 300 meters above sea level although it is known to grow up to 1000 m.
It has numerous uses. The young green fruits with seeds that are still soft can be cooked as vegetable. When ripe, the flesh can be eaten off hand or as dessert, or processed into candies, jams and jelly. Its juice is used for flavoring or packaged into refreshing guyabano drinks. The leaves are used as herbal medicine. Because the tree is small and tolerant of partial shade, it can be intercropped with coconut or with large fruit trees like mango, durian, avocado and jackfruit. The fruit consists of about 67.5% edible white pulp with a pleasing fragrance and flavor. It is a good source of vitamins B and C with some calcium and phosphorus. This plant is relatively safe from grazing animals. Actual observation revealed that even goats do not feed on them. However, just like other crops, they can be damaged by trampling of large animals. The plant also has a short juvenile phase. It starts flowering 2 to 4 years from seed. But old, bare-root transplants were observed to start flowering from as early as 6 months after transplanting. Fertilizing: To ensure vigorous growth, apply fertilizers regularly at the onset and end of the rainy season or every 6 months. Fertilizer application can be started a month after planting using ammonium sulfate (21-0-0) at the rate of 100-150 grams per tree. The rate is increased every year until the start of the fruiting stage at which time 250-300 grams of complete fertilizer (14-14-14) is applied. This amount is also increased every year from 1.5 to 3 kg plus 200-300 kg of muriate of potash (0-0-60). To ensure supply of micronutrients, organic fertilizers can be incorporated in the fertilization plan. Harvesting: Soursop continues flowering year round but the peak is May to June. The fruits are harvested when fully developed and still green. They are considered mature when their spines are set far apart and the shiny green color turns dull-green or yellowish green. Selective harvesting is practiced because the fruits on a tree do not mature at the same time. A cost and return analysis prepared by the Bureau of Plant Industry for guyabano planted at 5m x 5 m spacing shows a progressive increase in yield starting 4 years after planting with a fruit yield of 4.8 tons per hectare and a net profit cost ratio of 47.56% in the seventh year. In the 10th year, net profit cost ratio is about 200% with a projected yield of 11.8 tons per hectare. Data obtained from Hawaii, however, disclosed that with 215 trees per hectare fruit yield in the 6th year was 18 tons per hectare (Verheij and Coronel, 1992).